HGP – Investment in TemperPack Technologies, Inc.
HARBERT GROWTH PARTNERS IV, LP. 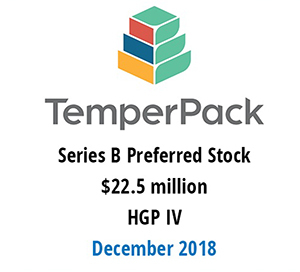 Harbert Growth Partners IV, L.P. (“HGP IV”) recently co-led a $22.5 million Series B financing round for TemperPack Technologies, Inc. (“TemperPack” or the “Company”). Brian Carney has joined the Company’s Board of Directors as part of the financing. Headquartered in Richmond, VA, TemperPack designs, manufactures, and distributes sustainable, thermal packaging products for customers in the perishable food and life sciences industries. The Company’s most innovative product, ClimaCell, is certified for curbside recyclability and allows customers to protect temperature sensitive shipments while reducing packaging waste. TemperPack’s products can be used to replace expanded polystyrene (“EPS”) foam coolers and other plastic liners.